Here you can find out the dates of when the next meteor shower is due to take place, they are indicated in blue on the calendar and you can use the controls to select different months. It may take up to 30 seconds for the data to load depending on your browser. If you click on a particular event in the calendar you will see basic information such as date, speed, colour, radiant, zenithal hourly rate (ZHR – how many at peak) and timings of that specific event. Information is approximate and may be subject to change closer to the time of the showers. Dates given may vary slightly from year to year and some showers give much better shows every few years. The presence of a bright moon will severely reduce the chances of seeing meteors. 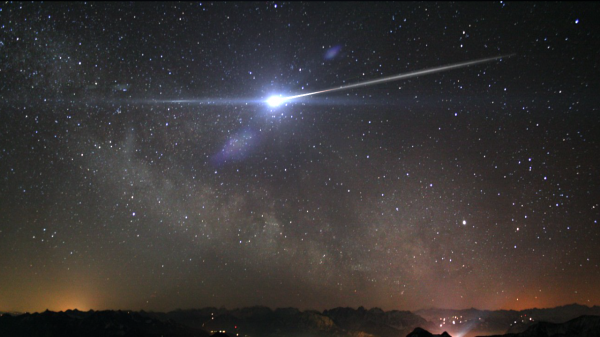 The best time to see a meteor shower is always late evening and between midnight and dawn and no equipment is needed. All you need is your eyes warm clothing and maybe something to eat and drink to keep you warm. For more information on what meteors are and how to observe them see “What Are Meteors” and “How to Observe Meteors”. You can find more information in the “Science and Observing” and “meteor Info” sections of this site. This calendar is for general interest purposes only and is not exhaustive, more information will be added on a regular basis. At present only the dates of the main or major meteor showers are included.